I've just seen that I didn't write a March outlook. 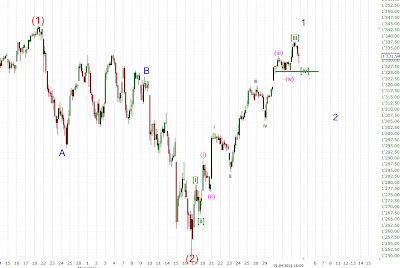 If you've read my daily updates though I think you know that I was looking for a correction into the 1220-25 area. The market only declined to 1249 though from where we've seen a huge bounce indicating that we've probably already seen the wave (2) low. A second wave usually retraces at least 50 % of the first wave. 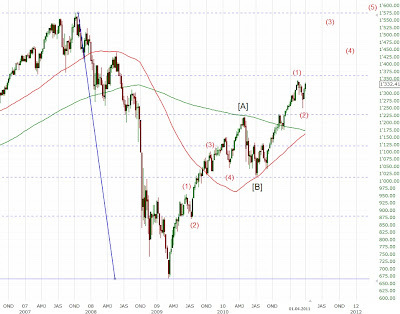 The current wave (2) has only retraced 28.5 % or 95 points so far so have we seen only a part of the correction? Almost all waves since the bottom in early 2009 have the same characteristics: The first wave is usually the longest and most powerful wave. 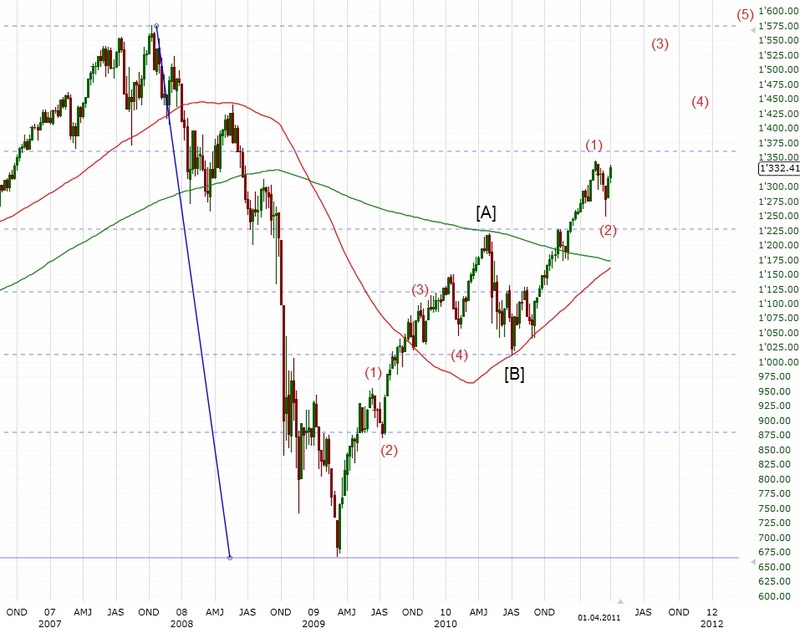 Thus, Intermediate wave (3) is likely to be shorter than wave (1) so my target area is around 1500. 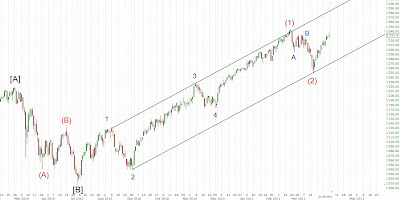 A fourth and a fifth wave should then complete the motive wave, which started in July 2010, around 1600 early next year. 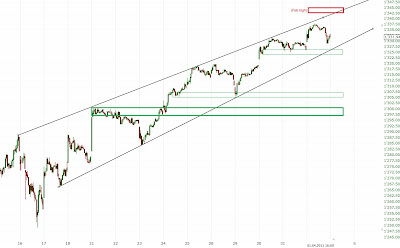 Once the yearly highs are broken my next target is the rising channel line (~1400). It looks like we need one more rally to complete wave 1. 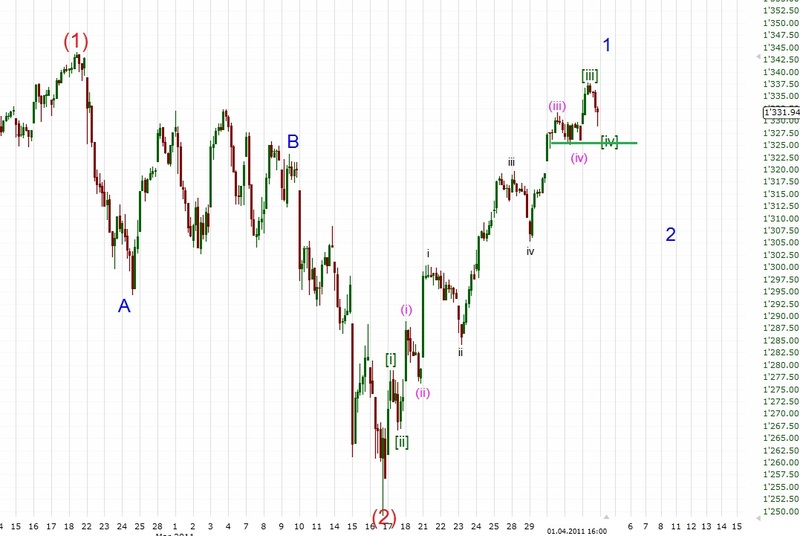 After that a wave 2 should follow down into the 1300 area. A break below 1325 should confirm that wave 2 is underway. 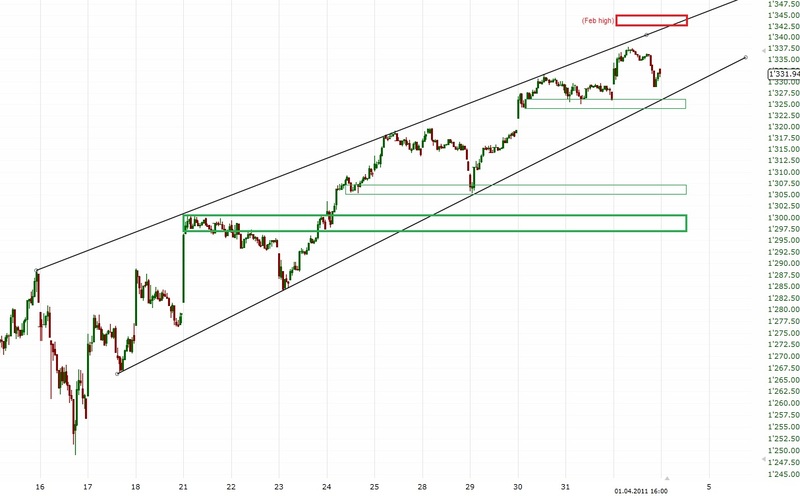 Short-term support is at 1325-29 and then around 1300. Resistance is at 1344. To sum up, unless we get a convincing break of 1300ish I think that we'll see more upside in April. There are obviously other counts around in the blogosphere. I'd like to keep it simple though and focus only on the count which I think is the most probable. In my opinion it helps you more if there is only one count instead of like one primary count and three alternatives (i.e. something for everybody). If you have any questions, suggestions etc. email me at admin at wavaholic dot com.